You get to stay in an ethnic cottage style resort inside forest with a traditional village located closeby.Kyari V Resort is an effort to conserve the biological & cultural diversity of the region by strengthening protected area management systems & increasing the value of a sound eco system. Kyari means a small piece of fertile land that is extremely rich in flora & fauna. Kyari is also home to five small & big rivers. Today, more than 100 families make up the village Kyari maintaining its rich traditions & customs. V Resorts is a chain of hotels in Uttarakhand, which offers deluxe accommodation in various tourist destination of Uttarakhand. The Kyari V Resort is located at Gram Kyari at Ramnagar in the Nainital district of Uttarakhand. 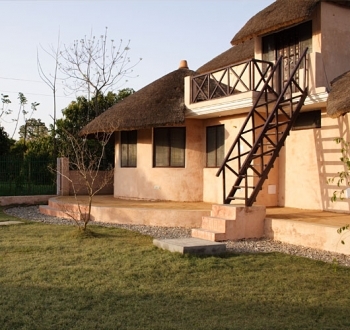 The village resort is just 8 Kms from Ramnagar. To reach Kyari, you can park your car in a designated place in Ramnagar city and the resort vehicle (Green Gypsy) will pick you up and leave the road to drive inside a dense forest. You would drive approx 8 kms inside this interesting forest which will meander you thru 6-ft tall anthills, thick shrubs, tall trees, several bunches of monkeys, deer, an occasional elephant and more than one tiny hamlets of village folk with their simple life and manicured farms. V Resort Kyari is equipped with all facilities to ensure a comfortable living. The resort has 14 well appointed rooms. The rooms are classified under 3 categories: Rustic Rooms, Rustic Family Rooms and Dormitory for Groups. 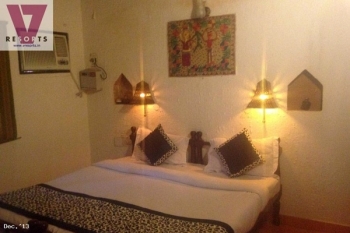 All the rooms here are cosy with the ambience of a typical village room. Beds, a table and storage cabinets adorn the room with an attached bathroom with hot and cold water supply. In Kyari camp V-Resort you will get the the oven fresh & home cooked food satisfying your taste buds at our restaurant. Overlooking the Farmland on one side and the jungles on the other, enjoy the best of the traditional Indian delicacies and the special kumaoni food cooked by our chefs. For Groups (GIT) Travellers, i.e. 4 or more rooms booking. The Kyari resort is almost 270 kms from Delhi and be reached by Takin Highway NH24. The pantnagar is nearest domestic airport 90 kms. Nearest railway station from Kyari is Ramnagar 14 kms and an easy for tourist to get an access to the resort.